The Bruce Springdale Oak Gunstock 3/8 in. Thick x 3 in. 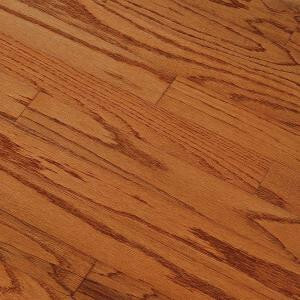 Wide x Random Length Engineered Hardwood Flooring is constructed from real domestic red oak hardwood. Its medium color, high gloss finish lends warmth and beauty to your home, bringing elegance to your decor. This 5-ply engineered flooring has square edges and can be installed on all levels, including the basement, for versatile applications within the home, using either the floating, staple or glue down installation method.